Since most of the people are using Android smartphones now it is obvious that they will need the apps according to their requirements. We have tried our best to list some of the useful and important apps which will can be installed and made use of them. 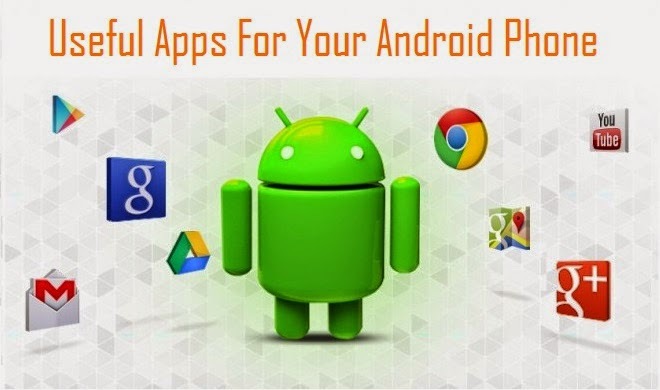 Here is a list of some of the useful Android apps for your phone that will help you be more efficient and productive as well as these apps will be helpful in serving purposes of your daily life. We have excluded some of the mostly used apps like WhatsApp, Facebook, Google+, Hangouts, WeChat, Instagram etc. Lets find out some other useful apps which is not so much popular but helpful for specific people. Clean Master : Clean useless files and residuals installation apps from your Android phone and also recover precious disk space and speed up the device. File Wrangler : Easy and powerful file manager for Android. Easy Backup :Take backup your SMS, MMS and call records to the external SD card. BackupPro : Take backup your phone and transfer your data and media file to another device. DU BatterySaver : Fix your phone's battery problems and extend the device’s battery life. Reader — See PDF files on your Android phone. It can also open password protected files. Keep : Take notes, to-do lists, voice memos and photo notes with searchable text. Any.Do : Manage your tasks and to-do lists with Google Tasks sync easily. Ustream : Let you app tell you when you have free time and suggests task automatically. Easy Alarm : Assign any YouTube songs as your wake-up alarm. Contacts+ : Beautiful contact manager for Android that display profiles for your contacts. Readability : Shares web pages to your Kindle for reading later in a clutter free environment. Avast : It will secure your Android device against theft, viruses and phishing attacks. AVG AntiVirus : It will protect your device from viruses, malware and fake apps. Poweramp : An advanced music player for Android with clean and beautiful interface. Saavn Music : Users who listen to Bollywood and Indian regional music and radio. Listen with this app on your Android device. SoundHound : Detects music playing around you with a single tap or by entering words from the lyrics. Shazam : Similar to SoundHound, Shazam offers a button to tap and that instantly recognize music playing around you. Subsonic : It fetches music from the desktop and listen on your phone or tablet anywhere, anytime. TuneIn Radio : Live radio stations and podcasts from all over the world can be accessed. My Tracks : It will record everything wherever you go. Your path, speed and distance will be recorded when you walk or drive. Glympse : Similar to Google Latitude. It is an alternate app that shows where your friends are. Expensify : It makes expense reports for travelling on business purpose. HomeStyler : Take a picture of a room, place furniture and visualize the interior design in 3D. Photo Grid : Create collages and photo walls in different layouts quickly. Repix : You can remix your photos and turn them into piece of art. Screenshots : Easily capture screenshots of your Android device with keys or action triggers. Pixlr : An useful photo editor from Autodesk that is absolutely free. Aviary : Another photo editing tools that will make your photos stand out. Fing : You can find out which devices are connected to your Wi-Fi networks. TeamViewer : Access your Windows or Mac computers remotely from any Android phone. Splashtop : Access your Windows or Mac computer from any Android phone over WiFi. WiFi Manager : You can find out Wi-Fi networks around you and connect to the best network. WiFi Analyzer : You can analyze your Wifi and expand the reach of your wireless router. AirDroid : Easily transfer files to and from your Android device wirelessly without cables. FoxFi : It makes your phone into a mobile Wi-Fi hotspot and share your data connection. SmartCam : It makes your mobile phone into a webcam for your computer. Flipboard : A popular app by which you can read news and updates from your favourite source in a beautiful, magazine style layout. News 360 : Informative and useful news reader that collects stories around your topics of interest and displays in categories. µTorrent : It is the most used downloader app. Torrent downloader from the team that invented BitTorrent. tTorrent : An alternate for µTorrent. You can download torrents directly to your Android phone or tablet. Viber : Useful app to send free messages and make free calls over 3G or WiFi. Line : It can send unlimited messages and make free calls over VoIP. TrueCaller : It can detect calls from unknown numbers and block SMS and calls from spam numbers. Shush : It keep track and remembers to unmute your phone after a certain period. HelloText : Hello is a good alternative, in case you don't like your inbuilt SMSing app. MightyText : It sends and receives SMS text messages from your desktop computer. Smart Voice : It records high-quality audio while skipping the silent portions. Cogi : It will record your college lectures or the conversations when you are in meetings. Hope you will use the apps and share your experience by leaving your comments here.